Ordinary markers seem pretty ordinary when compared with highlighters. And ordinary highlighters seem really ordinary when compared with the super-cool, custom neon, 5-in-1, whizzer-keen highlighter attached to this book. Every page is uniquely designed for young kids wielding highlighters. There are dot-to-dots to uncover, mazes to run, hidden pictures to find and pages to colour, including an aquarium filled with black-and-white tropical fish. The whole package is cool and colourful fun starring the world's first really magical 5-in-1 marker. And speaking of magic, when it comes time to clean up, just close the book! Comes with a unique 5-in-1 highlighter pen. 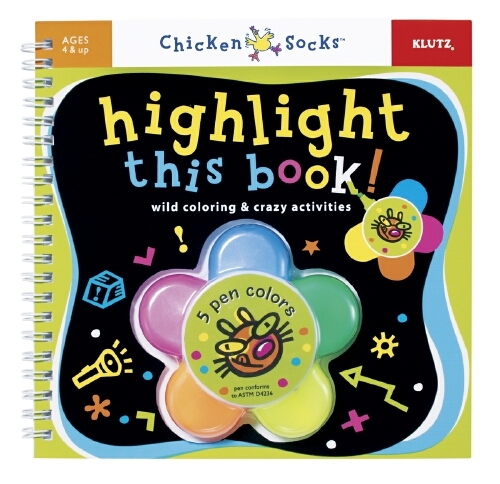 HIGHLIGHT THIS BOOK CHICK SOCKHighlight This Book!